A British novelist has been awarded legal damages in excess of £100,000 because she writes thrillers, not literary masterpieces. What's at fault? She's been inhaling fumes from a nearby shoe factory. The author "claimed to have become so intoxicated" by the fumes that "she was reduced to writing thrillers." Indeed, the fumes grew so intense "that she was unable to concentrate on writing her highbrow novel, Cool Wind from the Future, and instead wrote a brutal crime story, Bleedout, which she found easier." That book went on to sell 10,000 copies. 1) Literary judgement. Why is one "reduced" to writing crime thrillers? Perhaps Henning Mankell is more interesting than, say, Zadie Smith. This writer thinks so, at least. I.e. me. Perhaps the traumatized British author under discussion here should actually owe money to the shoe factory – a small percentage of her royalties, for instance – or at least an acknowledgment in the book. 2) Environmental causality. 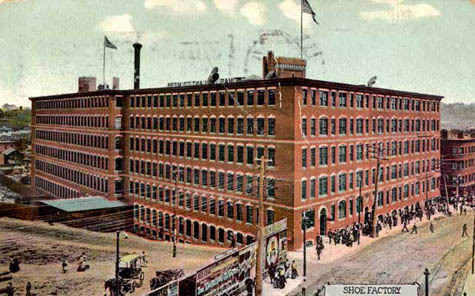 Perhaps BLDGBLOG is caused by the fact that I do not inhale fumes from a nearby shoe factory. Perhaps I find it difficult to concentrate on anything but architecture because of my city's aroma... I'd thought it'd been all the coffee. 3) Paranoia. Perhaps you, right now, are inhaling something that prevents you from writing your own Ulysses. Perhaps you are being held back by untraceable smells. Perhaps your life is being quietly reshaped by something you can neither see nor properly talk about, some vast and mysterious influencing machine that manipulates you from the outside. Perhaps that machine is a giant shoe factory. 4) Theft, unauthorized use of services, and/or copyright infringement. Perhaps this woman has been using the shoe factory's fumes without permission. Perhaps, Delphi-like, they have been wafting through the neighborhood for someone else's use, mesmerizing home scribblers into a state approaching hypergraphia. Perhaps there was another writer in the flat next door furiously pounding out thrillers and loving every minute of it. Perhaps this woman had no right to use the fumes in the first place – like taping a film whilst sitting at the cinema. Put the pen down, love. These fumes aren't for you. It's a form of neurochemical shoplifting. 5) Scapegoating. Perhaps you can't finish the novel you started writing last summer because of London. You don't live in London – in fact, you've never been there – but it's distracting you. It's forcing you to write emails to friends, instead. You haven't touched your novel in ages. You should sue London... Or perhaps all those buildings you see everyday are preventing you from being a good architecture critic. It's not your eye for detail – it's the buildings you're forced to write about. Perhaps the streets you take to work each day are not inspiring you to travel abroad and be interesting and do something fun with your life. Perhaps your coworker's cubicle makes you terrible at data entry. Perhaps nothing is your fault at all. Perhaps the color of Manhattan taxi cabs prevents you from writing good music. You're now homeless. You prepare to sue. So is your neighborhood causing you to write – or not write – highbrow novels? Can you prove it? Or do you only cook spaghetti because of the sad little street you live on – when, really, you're a gourmet chef...? What is your city doing to you? Think of the potential for an environmental criticism which incorporates the place of creation into the reading of the text. Presumably leading to neo-Borgesian speculation about an alternative Shakespeare who spent more writing time away from the odours of Tudor/Stuart London. There is some related folk tale legal precedent in "The Stolen Smells" which according to Sharon Creeden's book is of American origin. However, the only versions I could find online were one set in Japan and a video of the story as set in India from the PBS children's show Between the Lions. Pursuing an MFA at U.of H. I've been concerned about the effects of Houston's pollution on, not only my physical health, but my creative abilities as well. I also suspect that my landlord sprays ungodly amounts of insecticides in my apartment when I'm at home in Austin during summer and winter breaks. I've discussed these issues with my wife, an attorney, and I attribute her indifference to them, and her antipathy toward litigation, to consistently high pollen counts here. Oh no! What wondrous lowbrow gems of dour British crime fiction have been lost to us, given that the cobbling industry in the UK has dwindled to at least a third, if not a quarter, of what it was even 30 years ago? Now we know why Cormac McCarthy wrote No Country for Old Men after the 1000 pages of The Border Trilogy: it was that damned shoe factory next door! Well BLDGBLOG is directly responsible for my losing hours of productivity, I could be working on a paper right now instead of writing this comment. Also, all of this speculative nonsense doesn't exactly contribute to my employability as much as if I were working on my AutoCAD skills. Geoff Manaugh, I'll see you in court! I really need to find a way to use this on The City Desk. This entry made me laugh out loud! My City caresses the back of my neck, sending a chill of anticipation and lust from the top of my spine to the milky white of my inner thighs. Then my City gently yet firmly pull me onto the bed and showers my heaving bosoms with passionate kisses. "I could've been a carpenter, but I was so angry about bloody PEOPLE everywhere that I was reduced to philosophy."